Moving shrubs and winter protection of gunnera & tree ferns. Remembering 'The Beast' from last March it is time to batten down the hatches in the garden before the first frosts come. 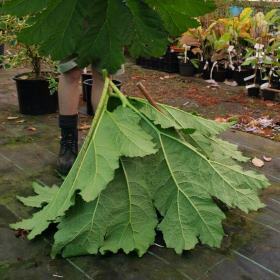 Put the fleece over the crown of your banana plants, cover the crown of your tree ferns with leaves or straw and protect your Gunnera rhizomes with the old leaves from the plant itself or with dry leaves. 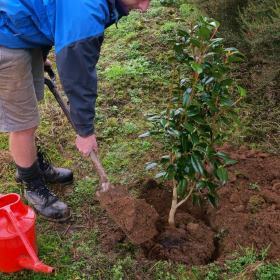 Check all your stakes and ties on young trees planted in the last three or four years; loosen the ties if they are cutting into the trunk and make sure the stakes are man enough for the wind and gales to come. 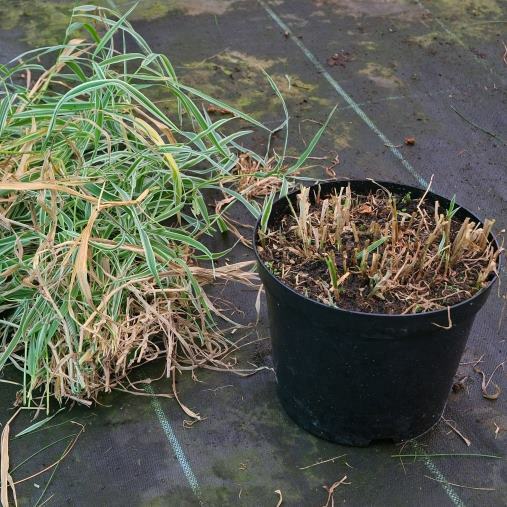 Now is the time to lift and divide your herbaceous plants before giving them a heavy winter mulch. Those plants with thick fleshy roots (eg Alstroemeria, Cynara, Peony) may be best propagated by taking the cut roots into the greenhouse and setting them in trays or pots of compost and soil to be replanted again when they are shooting away in the spring. Those plants with more matted root systems (eg Asters, Astilbe, Leucanthemum, Eryngium, Hosta, Hemerocallis) can be lifted with a fork and the crowns separated by hand or the clump can be divided more vigorously with a spade. Time then also to mulch over the more tender herbaceous plants to give them a good feed and to protect the early new shoots next spring (eg Lupins and delphiniums). Winter flowering heathers will be starting to brighten up the drabness of autumn. Time perhaps to order up some Erica carnea 'Ann Sparkes' or 'White Perfection' if you do not have these in your garden. The anticipation too of the first flowers on Daphne bholua 'Darjeeling' before the end of the month and on Camellia 'November Pink' or 'J C Williams' if the weather remains mild. Time too to treat yourself to something which will probably be out in time to give you flowers for Christmas – Rhododendron 'Christmas Cheer', Camellia 'Yuletide' or Hamamellis mollis. 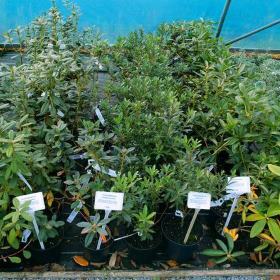 Why not plants as presents for your friends and family for a properly 'green' Christmas? Pink in bud fading to white. We have over 200 plant care articles now which can be found on the website. Additionally if you login to your Burncoose Account you will find a care article library which is based on all the plants you have bought from us, so you can use this as quick way to find useful articles throughout the year.